Disney’s rendering of all of your childhood memories into sobering, instantly aging CGI will next make you believe an elephant can fly, because elephants fly on computers now. 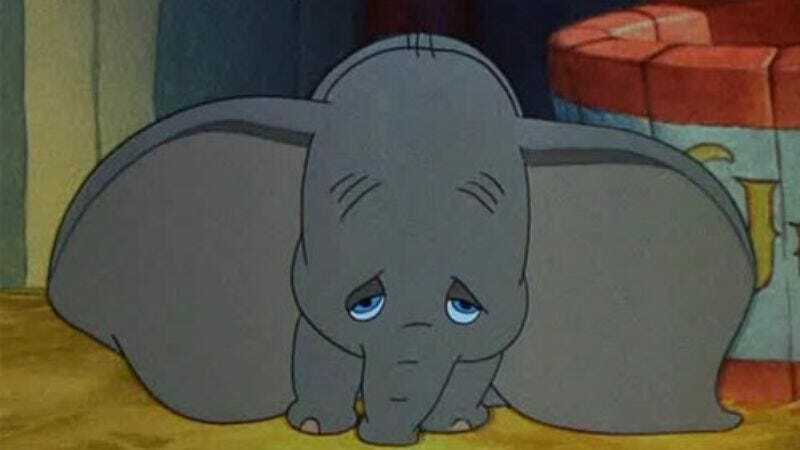 The studio is now developing a “live-action” take on Dumbo, its classic animated tale of a baby pachyderm who becomes an outcast for his oversized ears, then seeks to overcome his feeling like a weirdo by hanging out with a mouse who’s obsessed with a magic feather. Much like its revisionist adaptations Alice In Wonderland and Maleficent—and soon enough Cinderella, The Jungle Book, and Beauty And The Beast—Disney’s new Dumbo will offer a new take, adding “a unique family story that parallels Dumbo’s story.” Having some new people around will also eat up any screen time that might otherwise be devoted to jive-talking crows. Attached to write Dumbo is Ehren Kruger, whose experience on the Transformers franchise makes him uniquely suited to nostalgia-based projects where humans awkwardly interact with things that could crush them, and where you don’t have any idea what the hell is going on. According to The Hollywood Reporter, Disney believes that “because of the current state of CG technology, live-action movies featuring a soaring pachyderm (or any animal for that matter) are viable”—a declaration you should remember, for when Disney announces its inevitable Air Bud reboot.